Understanding sometimes means leaving home, and I could tell them to think about the word’s other manifestations in expressions like “you will rue the day” or the adjective form “rueful.” That might help, but only if they have rued the day or have felt the sort of regret for which “regret” is not enough. I could explain that rue is also a European herb similar to poison ivy that, medicinally, was sometimes used to abort pregnancies. They might derive an intellectual appreciation for the word’s history, but I wonder how much closer they might come to its implications. Because rue feels like more than regret to me. I rue not calling my father the weekend before he died. It was on my to-do list, and I might have spoken to him one more time while his brain was unscrambled by pain. He might have understood at last how much I loved him. I rue the angry words I’ve said to my children they’ll likely remember always. I rue the crossroads where I took strange turns or decisions on the brink when I chose to leap or stay put when the other course was best. My students would certainly understand some of that but might have to take my word for the rest. Words are like planets so thoroughly adorned with rings and satellites that they aren’t really one body. The invisible pull of matter, the tidal swings and peculiar confluences of position, the tugs of hidden motion—all conspire to create complexity impossible to communicate or understand. Words truly aren’t enough. I’ve been cataloging all I rue. Perhaps it’s my age, but I sometimes feel as though I’ve awakened to find myself somewhere else. Most of what I discover is a happy surprise—please believe me, I do know how very lucky I am—but I also see disappointed hopes and begin to feel opportunities waning. Thoreau said, “To regret deeply is to live afresh,” and I still sense a new day in every realization. But I’m not so fresh anymore and sometimes feel worn out by countless resolutions to get-up-and-go, put everything behind me, and move on. Too often I’ve known I should and haven’t. I’ve got to change that. Instead I rue. And it occurs to me that I shouldn’t share this emotion with students who believe one word enough, who believe and dream. I’ve wished for their remorse when they should feel sorry, but I’ve never wished for their rue. Better to live with my own and seek a way forward. Occasionally, when I share my writing with students, they ask, “Are you published?” The question is a compliment, and I should say, “No, not really.” Instead, I slip into evasions. “I haven’t really tried,” I reply, or “I’d like to, but it’s hard.” Or, “I have a blog” with that strange half question mark at the end to test whether it counts. It’s embarrassing to love writing, teach writing, and write as much as I do with little public work to show for it. It’s especially awkward because ambitious students want role models, proof their goals are reasonable. They’re asking if I put myself out there and try to reach my dreams as I encourage them to. Or, at least, that’s the way I hear them. This response is a lie and an excuse but, worse, it’s horrible for them. Anything worth having is worth working hard to achieve, and students need to know that. I have time. Time is not hanging me up. Some part of this statement could be true. More than 10,000 hours writing here and elsewhere have made me capable… but publishable? Who knows? This answer is unproductive too. If I mean to improve as I want students to, hearing from editors could move me closer. Otherwise, my self-deprecation is affectation—untested, false, turning myself down before anyone else can. One of my colleagues at school is a published writer… a very talented, unabashedly public, and locally celebrated writer. He’s suggested he dislikes blogs because being approved by a publisher carries more weight than clicking “publish.” He’s right—ratification matters. No one likes rejection, and I don’t know how I’d feel about squirreling it away in three-hole binders as some former MFA classmates do. As infrequent and sporadic as my publishing efforts have been, I’ve heard from enough editors describing how short my work fell or totaling submissions as if chiding me for wasting their time. Those experiences move some people to try again, but friendly audiences keep me posting each week. Maybe I’m too unsure, too sensitive, too fearful of failure to be a real writer. Or cowardly. I sometimes wish I could tell my students so, but I never do. I’d like them to believe I can bear rejection. More importantly, I’d like them to believe they can. They turn in work to me despite what awaits them. I wish I were as receptive. In the end, I can’t answer their question because I can’t find an answer myself. Part of publication is out of my hands, but the part I control is twisted in contradictory emotions. The truth in having so many answers is having no answer at all. When I talk to students about critical essays on literature, I try first to adjust their audience and purpose. You are writing, I say, to another reader. You are hoping, I say, to illuminate something specific the reader has not seen before. Being a literary guide seems to make writing more manageable for them—it gives them direction beyond being commanded to write—but my motive is selfish. Guides are more interesting than formalist drones. I want their criticism to be purposeful. In the January 2nd edition of The New York Times Book Review a number of smart people give quite different reasons for literary criticism. The feature “Words About Words: Why Criticism Matters,” offers the views of six critics. I don’t claim to understand everything they say—some pieces seem more lament or rationalization than justification—but they do make me wonder if teaching students how to write about literature could have a more profound function. In arguing the importance of criticism, the Times authors seem divided over whom it might matter to. If criticism matters, then who benefits and how? Stephen Burn seems to see the critic as a valuable counterbalance to the proliferation of opinion on the web and elsewhere. Katie Roiphe highlights the critic’s challenge to write, “Gracefully” and “protect beautiful writing” and “carry the mundane everyday business of literary criticism to the level of art.” To Pankaj Mishra, “Literary criticism was always destined to turn into a kind of competitive connoisseurship—a parlor game,” but will be relevant only as long as it anchors authors’ works in cultural and historical contexts. We need a critic, he says, to identify a writer’s “Particular quarrel with the world, the rage or discontent that took her to writing in the first place.” In each of these cases, the critic serves society. Criticism, all of them suggest, is good for us. I would have a hard time selling these goals. Many of my students are so immersed in popular culture that they do not know they are there. Some do argue with the modern world, some seek beauty, some hope to spread understanding about peoples and times, but those students are uncommon. And those uncommon students don’t always write reliably compelling criticism. Extrinsic motives often contribute to stilted and reaching work. Instead of engaging a text, they use literature for a higher purpose, taking a reader away from instead of into the authors’ words. And I’m afraid to give students such exalted aims. They most need to string together a few sensible and effective sentences, make discerning observations, and be themselves. The more convincing portions of the Times article suggest organic, implicit compulsions. I have many students who resemble the former self described by one of the authors, Elif Bautman. She tells of time when she felt criticism superfluous, citing her understanding of Tolstoy’s rebuff of a critic: “The only accurate interpretation of Anna Karenina was a word-for-word retelling.” I have students similarly reluctant to interpret. They think we read too much into Shakespeare and Golding, Dickinson and Salinger and, in some sense, we violate authors’ intentions by breaking up the whole, proverbially murdering to proverbially dissect. Bautman says her salvation was recognizing literature as a sort of dream where the author acts at least somewhat unconsciously, in ways he or she doesn’t entirely recognize. If our own minds baffle us, authors might create literature beyond their own understanding… but not beyond careful guides. Our work is a kind of ground zero of intertextuality, in which one text converges on another to create a third, hybrid, ultratext. This self-reflexiveness doesn’t make critical writing secondary or parasitic, as critics of the critics have said for centuries; it makes it complex and fascinating and exponentially exciting. For every student reluctant to analyze literature, I have another who buys into criticism too ardently and writes papers arguing for seeing a literary work in a correct light. They attempt tight legal cases aimed to establish, beyond doubt’s shadows, that THIS is what the author intended, that THIS is the true meaning or implication of this work. Anderson’s perspective offers a valuable anodyne for both the skeptic and the zealot—the critic’s job isn’t to redefine literature. 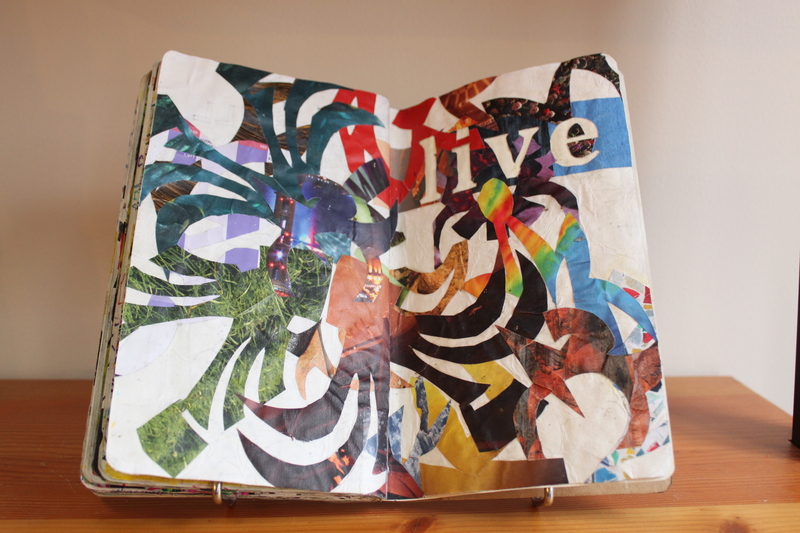 Quite the contrary, the critic adds to the original, makes more of the work visible and significant. Critical essays supply exponents. Call me crazy, but I enjoy papers written from that stance. If I could get my students to see their interaction with stories, poems, plays, and novels with that sort of vitality—as a way to discover themselves and something bigger than themselves—their criticism might mean much more to both of us. They would no longer be writing five paragraphs but true essays that, however flawed, seek revelation. 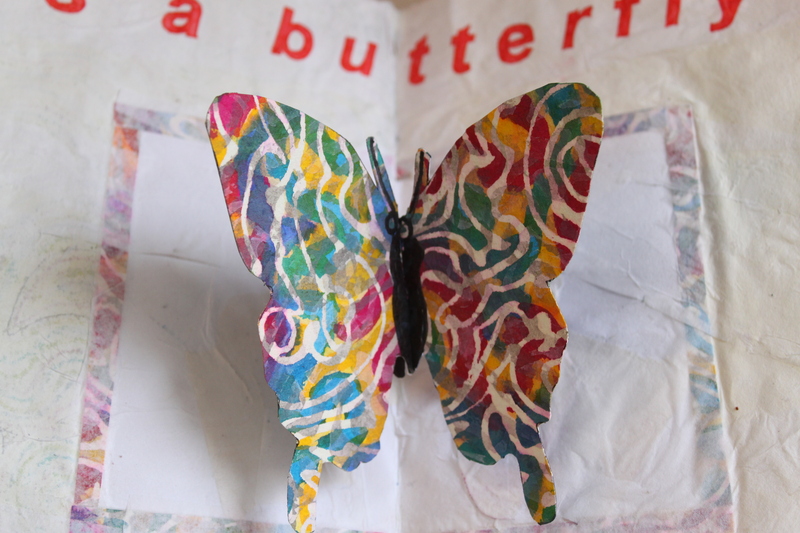 This morning, I left a note on my haiku blog announcing I’d no longer be posting daily haiku. My streak ended at five years. I don’t expect the news to be picked up by a major media outlet—that blog averages six visitors a day—but it’s a big deal to me. In my debate between process and product, process usually wins. After all, it isn’t about this essay but essay writing, not about this drawing or painting but art, not about haiku but haiku-ish-ness. If the aim is practice, any one effort matters less than habits of self-expression, efficiency and method, a way to work, not individual works. Process allows endless growth, for what is a product but a frozen frame of that moment? True practitioners move on and up, improve, as adequate instantly becomes inadequate. Process is also a dodge. Authors write novels for publication, illustrators want to see images beside text, poets envision work collected, and painters hope to frame and show paintings. Creating a product has consequence process does not. Both reach that juncture where the artist must decide between good and good enough, but a product brings special pressure to perform, pressure for perfection. If you’re writing a haiku a day and your aim is haiku-ish-ness, good enough will usually do. It usually did. I have papers to grade. 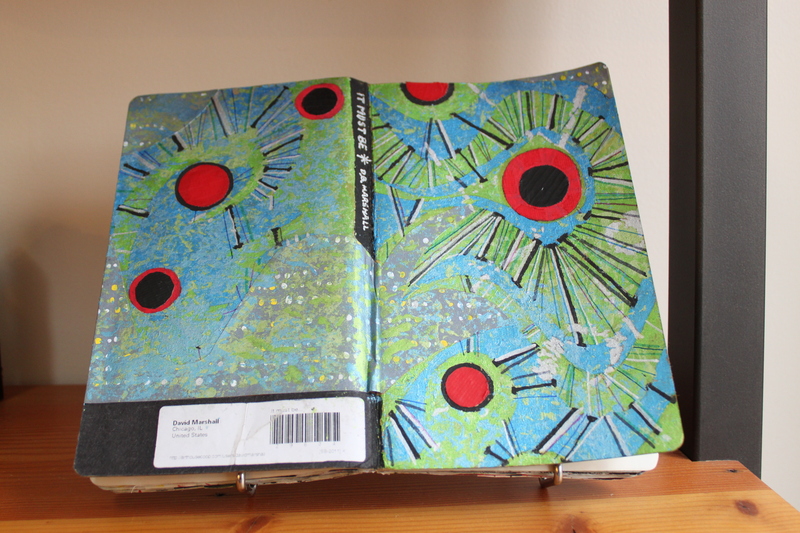 Since August, I’ve been creating a sketchbook for the Sketchbook Project sponsored by the Art House Co-op out of the Brooklyn Art Library. Each of the 28,000 participants received a moleskin notebook to fill, and, in January, those who completed the project will mail their notebooks back to begin the sketchbooks’ tour of the U.S. At each stop, people will look at the boxes and boxes of books, and, each time anyone picks one up, the UPC symbol on its back will be scanned to let the artist know—via email or text—that his or her images have been seen. 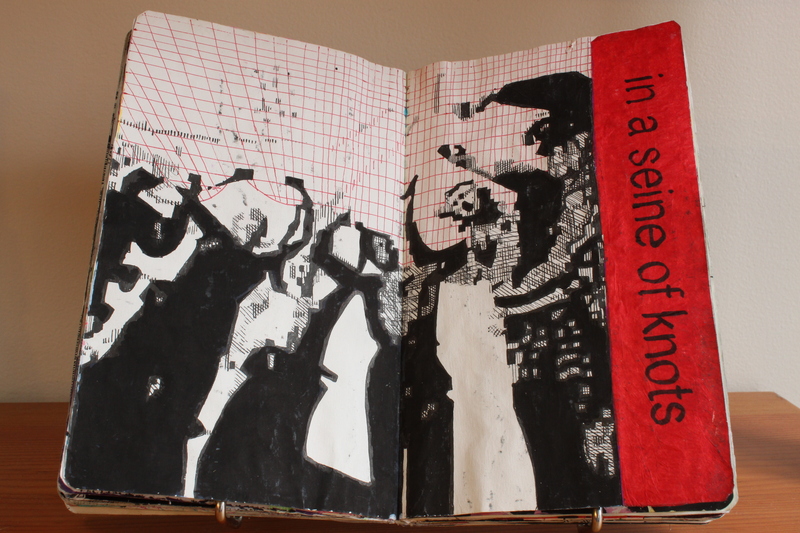 I finished my sketchbook last week, and pictures of a few of its pages appear with this post. My sketchbook isn’t perfect, but it’s different from daily haiku or my weekly post here. 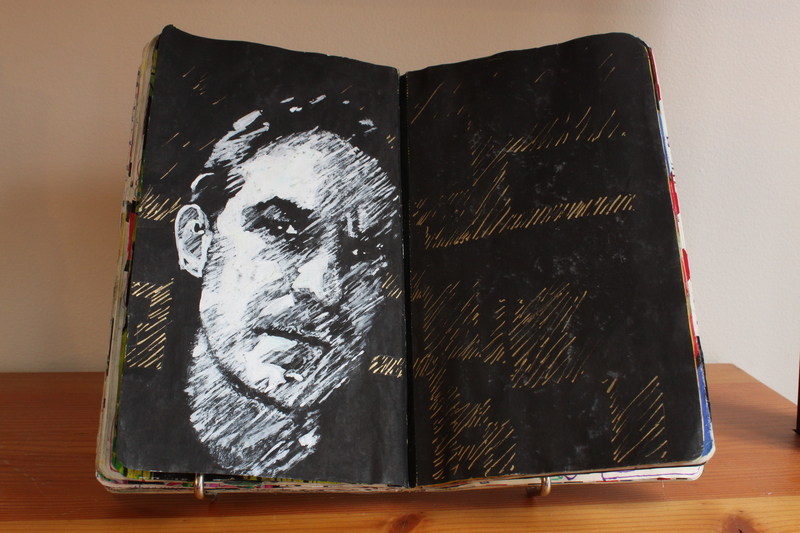 “Sketchbook” suggests experimentation, but the thought that strangers might see my art changed my approach. I felt disappointments more keenly and worked harder to rescue pages. I was more ambitious, reviving techniques I’ve long sidestepped as too arduous or time consuming. With the blank pages stretching ahead of me, the project took on gravitas greater than any two page spread, and I thought about variety, transitions, and “voice” in ways I usually don’t. And making art seemed new. The thudding reality of process is consistency. Especially at first, practice does create progress, but it soon brings comfort and the seductive urge to rehearse or, worse, to act out yesterday’s rehearsal. During the first 365 haiku I learned the personality of the form and how I might interact with it. The last 365 felt featureless, as if daily practice downloaded personality into discreet bits suitable for programming a robot. Why is it harder to explain what haiku is than it was four years ago? Sometimes it seemed haiku had become anything and everything, each reiteration equal and equally forgettable. It’s not really as bad as that. I’m grateful for haiku’s concision and emphasis on what’s resonant. Tomorrow’s haiku led me to examine today more closely. I like to think those perspectives crept into all my art, and I only need to lose technique to find myself again. It’s a new year, and I believe in resolutions. Without faith in perfectibility, I couldn’t practice writing or painting. I will keep practicing, but I’d like 2011 to be the year of the project, a time when rehearsal yields to performance, when I train to play. I want to make, show, and publish, starting with a book combining my paintings and my best haiku. Perhaps timidity and fantasies of finding a mentor, editor, manager, agent, or amanuensis have held me back. If you want to volunteer, I’m listening… but hope for more ambitious and reaching art might be a better spur.